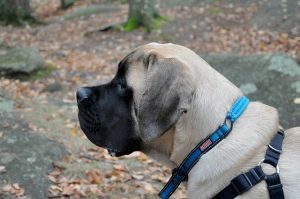 The English Mastiff is one of the greatest of the great large dogs and has a history that dates back to ancient times. 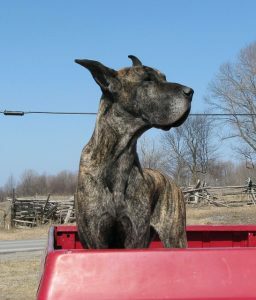 Although there is evidence of cross breeding to form what we now know as the English Mastiff, the EM (how I will refer to the do breed for this post) is a particular breed that many of the Mastiff dog types are descended from. Considered to be the biggest of the large dog breed in terms of mass, with an average weight greater than that of the St. Bernard, the EM is a canine that is impossible to miss! EM dogs have a generally sweet temperament, with an average life span of 7-9 years (though of course, this time will vary by care and the individual). It might seem a strange fact that the ancient Celts used EM’s as war dogs, given their seeming docile nature, but there are records that indicate that this is true. EM’s are used as hunting dogs today, though other, faster and more agile breeds like the Great Dane are more often preferred to this breed. A friend of mine has a fawn colored EM named Tiny (sarcasm runs very deep) that is a gentle giant and very much a typical example of his breed. A 5th generation descendant of my friend’s father’s dog, Tiny like long naps, cookies, and wrestling with people that are brave enough to provoke him to it with his favorite rope toy. I attempted this once, and to be clear, it wasn’t even a contest; Tiny won. English Mastiffs are a great breed and as with all large dogs, they may end up having health issues as they age. All of the weight on their bones starts wearing on them and arthritis is a common ailment in EMs. But, with a good healthy diet rich in protein and low in carbs, your English Mastiff can grow up strong and healthy. Be sure to have regular visits to the vet as well! These dogs are descendants of the Irish Wolfhound and Mastiff lines, and have been used to hunt elk, deer, and even bears! If you have ever seen one of these dogs trained to hunt, you understand how effective they can be at bringing down large game! The GD breed is also known for their loving temperament and loyalty, as well as being a very mellow dog near their middle to late years (though exceptions exist, of course). My father (from whom I inherited my love of large breed dogs) had a GD when I was first born named Sherlock. Sherlock was, according to my father, an exceptional member of his breed regarding his sense of smell (thus the name Sherlock, as he could sniff out just about anything). GD dogs, as a breed overall, have a good disposition towards children and strangers when raised properly, and an inborn loyalty means they make good companions and family security dogs (though the latter requires specific training to be safe and effective). 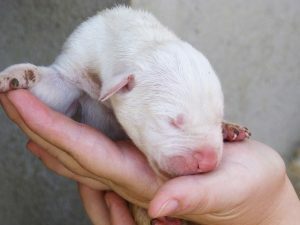 They start off sooo tiny! The name of this dog breed has a history of changes, with the Great Dane name actually being the result of growing tensions between Germany (the source of the breed primarily) and other European countries pre and post World War II. Though short lived compared to many other dog breed (GD’s typically live for 6-8 years, though exceptions exist), these dogs can enrich the lives of the owners,specifically those who choose an active lifestyle. GD’s need regular exercise to prevent bone and joint issues, though this exercise is actually something to avoid during their growing period to avoid damage that will stay with them long term and worsen with old age. Join us next time as we dive further into the large dog breeds! I am starting off our around the world trip study of large breed dogs with the massive Irish Wolfhound (Canis lupus familiaris) in part because I love the breed personally and because they are a large dog that has had such a significant place in the history of Europe. The Irish Wolfhound is a breed that dates back to at least the 4th century, where there is evidence that the Celts of the time used them to sack ancient cities in the area now known as England. The dogs have been used to hunt wolves (thus the name), bears and lions in Roman coliseums, and humans alongside conquering Celts and others. Considered by many to be of greater strength than that of bulldogs and even mastiffs, the were at one point in the history of England nearly driven to extinction due to their popularity among the noble and well to do. A significant reason for the dogs being so popular was their mild personalities, a contrast to many other large breeds used for hunting that made them easy to live and hunt with. I can personally attest to this attitude as I currently have a female Irish Wolfhound named Siobhan (pronounced Sho-vahn, FYI) who is one of the sweetest dogs you will ever meet. Siobhan loves lounging on the tile in our home’s entryway, which is a good place for a guard dog to enjoy hanging out at, and loves the snow! She is very obedient and loyal, not needy like a few other large breeds, and is great with our two kids who are in their preteen years. Another thing that makes the Irish Wolfhound an ideal breed for families is their classification as a sight hound breed. A sight hound is a breed of dog that relies more on sight and hearing than on sense of smell, meaning that they are less likely as a breed to react with rambunctious excitement at a smell that is appealing or otherwise.